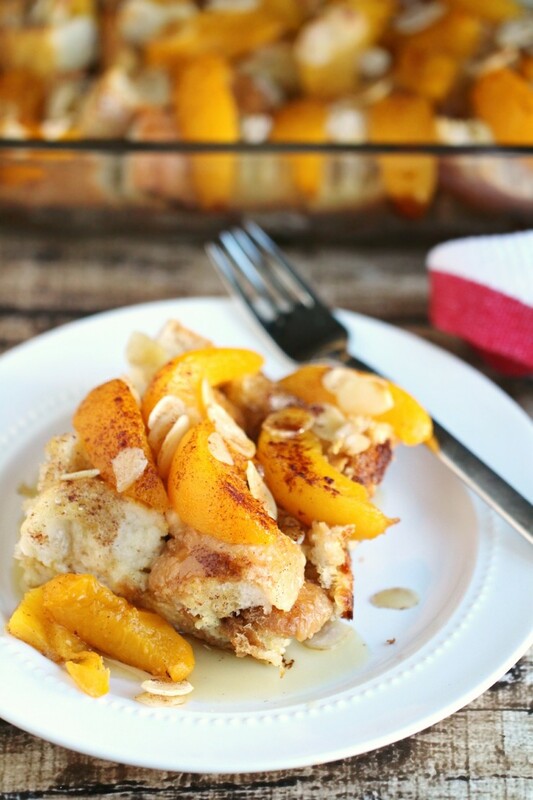 Peach French Toast Bake with Almonds - Frugal Mom Eh! 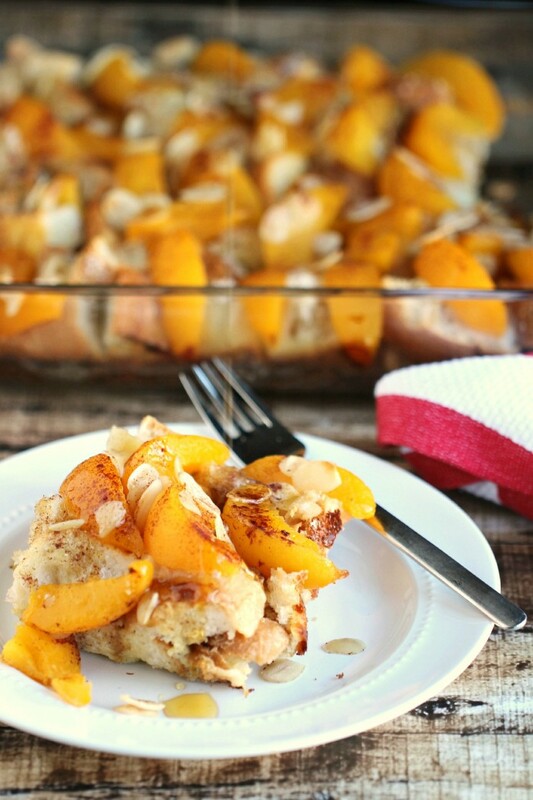 This Peach French Toast Bake with Almonds is an overnight french toast casserole. It’s an easy breakfast bake you might know as a wife saver breakfast – perfect for Christmas morning brunch! The holiday season officially starts with the Toronto Santa Claus parade this weekend. That means it is time to bring on the hot chocolate, extra blankets and plenty of comfort food! Just thinking about comfort food brings me back to my own childhood and my mom making piles of French toast for a special lunch smothered in maple syrup. There is just something about French toast that just speaks to my soul. Must be all those delicious eggs that go into it! There is seriously nothing like fresh Canadian Grade A eggs. They are filling, full of protein and essential nutrients and they are just plain old delicious. We can all feel good when cooking with Canada Grade A eggs knowing they come from Canadian farms known for their quality, & freshness. Canadian egg farmers are proud of what they have to offer and that includes eggs farmed in a variety of ways to suit your lifestyle from conventional, enriched, free run, free range and organic. It’s good to know though that no matter how the egg has been farmed, all variety of eggs in Canada come from hens that are not given hormones or steroids. 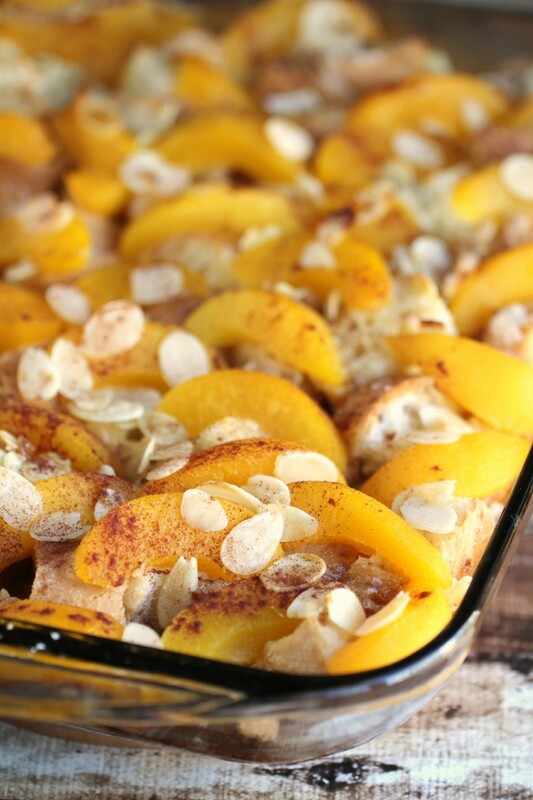 I was inspired by one of my most favourite comfort foods to share with you this peach French toast bake with almonds. 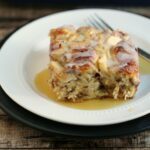 It’s an overnight french toast casserole, you might know this style of breakfast bake as a wife saver breakfast. It’s perfect for Christmas morning brunch as a family since it can be assembled the night before and popped in the oven while everyone opens their gifts. Who is kidding though? It’s so delicious and filling you will find yourself making it year round! 1 Day Old Baguette, Sliced into 1/2 inch cubes. Grease a 9×13 baking dish. Place bread tightly together in a single layer at the bottom of the pan. Beat eggs together with cream and mix in vanilla and 1/2 tbsp cinnamon. Pour the egg mixture over the bread then arrange peach slices to cover the bread. Sprinkle with remaining cinnamon and brown sugar. Cover tightly and refrigerate for at least 8 hours or overnight. Remove baking dish from refrigerator 30 minutes before baking and preheat oven to 350°F. Dot with butter and bake, uncovered, for 45 minutes. Allow to cool 10 minutes before serving with maple syrup. 1 Day Old Baguette Sliced into 1/2 inch cubes. Grease a 9x13 baking dish. Place bread tightly together in a single layer at the bottom of the pan. Connect with Egg Farmers of Canada for more great egg ideas! Like Egg Farmers of Canada on Facebook. follow them on Twitter @eggsoeufs and on Pinterest. You can also check out eggs.ca for more great Egg Recipes and information on egg farming! Disclosure: I am participating in the Egg Farmers of Canada campaign managed by SJ Consulting. I received compensation in exchange for my participation in this campaign. The opinions on this blog are my own. I love that eggs are so versatile, healthy, perfect for a snack or quick meal. So many reasons to love eggs. Eggs are a great source of protein and they are quick and easy to prepare. I love eggs! The taste and all the different ways to prepare them and use them. I LOVE all the options you have when cooking eggs.. SO many delicious ways! Eggs are a versatile and nutritious food that can be prepared many different ways to suit your taste. I love eggs because they are so versatile. They can be made 100 different ways for breakfast, used in baking, puddings/creams. I make a killer chocolate creameaux/pudding that uses many egg yolks, then use the eggs whites for Macaroons. I love eggs because you can make such a variety of dishes with them and they are quick and easy to cook. I love eggs because they are so versatile they can be made plain, whipped to top a pie, cooked for breakfast, added to cakes and baking to add richness and the list goes on and on. Eggs can easily be cooked in a LOT of ways! Eggs taste great and they are very satisfying! We love eggs for dinner especially! Eggs are FAB because of their versatility. I cook with them lots, and they are very satisfying and delicious. I love that theyre so versatile! I love that egg whites are a low-calorie, excellent protein source–very easy to cook with, too! When nothing else in the fridge inspires…there’s always eggs. I love eggs because they are so versatile and taste great! They are also the perfect food for my low-carb diet. Deviled eggs are still popular and an easy make years and years after my mother introduced me. I love eggs for their versatility. I love everything about eggs, and I love eggs every way too, eggs in Egg Nog, ceasar dressing, salads, fried, poached, hard boiled, and add into many many desserts!!! eggs can be used for almost anything!! I love the taste of eggs. Eggs are the best, they taste great and easy to make! I like that they are light and easy to digest. I love that they are so versatile, used as a meal, used in desserts, used in meals, used in eggnog. I love eggs any which way! Great for breakfast, lunch or dinner! Eggs are super convenient for those busy nights when you haven’t planned dinner! They are the perfect food and great for any meal. I love having an omelet or quiche for dinner. The nutritional value and versatility! I like how versatile they are. I love having eggs for breakfast in the morning and it’s nutritious as well. I love that eggs are a super cheap and easy source of protein and that you can do sooo much with them, from breakfast to appies to desserts. I love eggs because they can be cooked in so many ways making a quick and easy meal. I love the taste and the fact that they can be prepared in so many ways with so many different ingredients. I love eggs for the protein. I love that they taste great and are a good source of protein. I love how many quick dishes you can make with eggs. I love that eggs taste great, are super duper versatile, and are jam packed with nutrients and protein! I like eggs because they can be prepared in so many different ways and taste great ! I like that eggs are so versatile, great stuffed for parties, boiled or fried or scrambled for breakfast or brunch and they are essential for baking cakes and cookies. I love eggs, you can make so many tasty things. I love how many things you can make with them! They’re delicious on their own, or as a main ingredient, or as a secondary ingredient! And you can eat them for every meal and snack! I love eggs because you can make any dish eggstravagant with a little bit of eggs! So glad my daughter loves eggs, they come in handy on busy days! For some reason I did not like eggs as a child, so I am very glad I changed my mind as they are delicious. I love that they are quick and healthy and my fussy eater will eat them when we are busy. I love that eggs are so healthy and you can use them in so many recipes! I love eggs for the wide range of uses: fried with toast for breakfast, scrambled in a stir fry, baked in cookies., hard-boiled in a salad, or many other things! I love that there’s so much you can do with eggs from baking to a simple hard boiled. 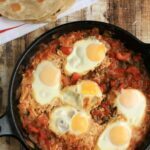 I love how quick and easy eggs are to make for breakfast, and how versatile they are for sweet and savory meals. I love that you can use them in so many ways and are easy to prepare. Eggs are delicious & nutritious! I didn’t cook regularly with eggs until I started making more Japanese meals at home. I used an egg to coat the chicken pieces after the flour and before the panko. Then, two eggs on the pan with tamari sauce mixture with onions on which the breaded chicken pieces are put on top of for Chicken Katsu Don. I also use an egg to glaze the tops of my choux cream pastry before baking. For breakfast, I fry an egg to go with my fish and brown rice. I couldn’t stand eating something terribly sweet as the first meal of the day, so, the egg, fish and brown rice became my nourishment as I also don’t like getting hungry after 5 hours. Though it takes more time to cook than grabbing box cereal, eggs are more filling and nourishing so, it became part of my regular meals. I like they are so versatile! They are healthy and there are so many different things to make with them! I love them for breakfast, lunch and dinner! I love the taste and texture and that they are so versatile. The fact that there’s so many ways to serve them! I love that eggs are a vital ingredient in so many recipes. I love everything about eggs. They are my favorite food. I love that eggs are easy to make and taste great so many ways. I love that eggs are a great protein source, low in calories and such a versatile food. They have so many uses in baking and cooking. Eggs are healthy. Eggs are a quick and easy to make in so many ways. Eggs are our breakfast everyday. Egg salad sandwiches are our favourite. You can’t go wrong with eggs. Eggs are healthy, good aource of protein and very versatile. I love how many different things you can do with eggs!! We eat a lot of eggs! And i love that I can use them in a really complicated recipe or just fry or boil and have food on the table in minutes. I like eggs since there are so many things you can use them for and they have a lot of nutrition, too. They are tasty and healthy! I love how nutritious and delicious they are! You can do a lot with eggs. And they are affordable. My whole family loves eggs. There are just so many ways to prepare them and all so delicious. I love that I can use them in so many dishes and the health benefits of eggs. I love eggs because they are quick, easy and delicious! They always taste good and can be eaten for breakfast, lunch or dinner. I love how versatile eggs are. And how quickly you can prepare a whole meal with them. Plus there is the baking ……. We love eggs. From baking cookies to providing the quick essential breakfast for on-the-go kids who have to get to work or to dance. They are so versatile and can to adapted to any meal. I love my eggs, I get worried I’ll run out if I have less than a dozen in the fridge! I love the versatility, that they’re nutritious, healthy and the taste is heavenly. The only form I don’t like too much are poached eggs. I just love their taste, no matter how they are prepared. 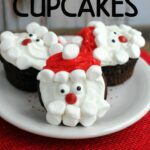 easy and quick to make and you can do so many different things with them! There’s just so much you can do with eggs! They can be the hero or the support act in a variety of dishes! Eggs are super easy to do for breakfast. Eggs are great no matter how they are prepared. Makes a wholesome snack, meal, or side dish. I love scrambled eggs, western sandwiches and egg salad sandwiches! I love how portable they are! Eggs are a good source of protein and their are many different ways to cook them. I love that they are protein packed and healthy. Thank you for the chance. eggs are so versatile and super yummy!!! Eggs are so delicious and healthy. They make any meal complete! I love eggs because my kids will actually eat them- LOTS of them!- and they can be used in such a huge variety of dishes and baking! I love getting a healthy protein from eggs after working out! Eggs have high-quality proteins, vitamins, minerals, good fats and a mixture of trace nutrients. They are also rather tasty. Eggs go with so many things, baking, savoury, on its own. Gotta love em’. Love eggs for any meal. Eggs are wonderfully versatile and nutritionally they are the perfect protein. They can be used for savoury or sweet dishes. I love eggs. I love eggs because they are the perfect breakfast food ; a handful of good memories in my life comes from sitting around the breakfast table & watching mom fry some eggs & bacon . A cozy sense of home life . Will definitely pass on that tradition to my own children ! Eggs are the best protein for keeping my energy levels high throughout the day. Eggs!!! I love them I like them cold, hot and anyway. I prefer poached but scrambled is good. Omelettes are fantastic. Boiled eggs are a great snack. So delicious! Who doesn’t like eggs! Eggs can be prepared in many ways – boiled. fried, poached, and can even be eaten raw (in a drink). To a home cook, eggs provide you with a lot of options. For the home baker, eggs are a must. Eggs are a key ingredient in most recipes, so what’s not to like! I eat eggs pretty much everyday – my favorite is an omelette with avocado and spinach but i eat them in all ways! Eggs are delicious, nutritious and versatile! I love Eggs. I eat eggs every day. Love that they have protein in them, taste great, can do so many things with them and they fill me up! I love how versatile eggs are, so important in many recipes. Also love eating them! I love that eggs are healthy and can be used in so many ways. Eggs have been a part of my world since childhood. Soft boiled eggs in little chicken shaped egg cups were a favorite ,poached eggs ,pound cakes ,lemon meringue pies! One of my favorite sandwiches is egg salad,potato and egg salads English custards ,omelets ,egg in a basket,buns and breads…. LOVE EGGS and Creating with them. a mixer would be great for all the baking ahead of me. Love eggs. Always have them in the fridge ready for the next meal. I love the many different ways eggs can be prepared and eaten. I love that you can cook them up in minutes! And take them with you for an easy snack! love eggs. They are so versatile, use them for any or in any meal! Aside from how delicious they are, I like that they keep my iron levels up, especially during pregnancy. I love that eggs are a tasty form of cheap protein. Eggs & peaches…Mm Mm Mm. Eggs are such a delicious staple for every meal and provide such wholesome goodness! Eggs are almost perfectly oval. They are inexpensive, versatile, easy and nutritious. They are so perfect and useful to have. Love eggs for their protein, versatile and scrumptious taste! I love eggs for their versatility and the way they can be dressed in so many ways. I love how much you can do with eggs. I love the versatility of eggs. You can use them on their own or combined them for savoury and sweet recipes! I love eggs because they can be eaten at every meal! I love eggs because they are SO versatile! You can literally use them for every meal if you want. And such a good source of protein and other nutrients. I love that eggs are so easy to make and they’re a very healthy choice! Eggs are so easy to cook! Eggs are so versatile and easy to cook. I love that they are so versatile. You can make so many great meals using eggs. Would love to win this. My family loves eggs. Would come in handy! I love poached eggs! And they’re so much easier than they sound. I love their versatility, and the fact it’s such a quick meal, using eggs. Eggs are a inexpensive and versatile staple in our house. I love that you can use them in almost anything. I love that eggs can be used in breakfast,lunch and supper and are nutritious and cheap! I love eggs – every time you serve them they can be completely different because you can add just about anything to them. As someone who doesn’t eat a lot of carbs/starches, eggs are my go to food! I love them and eat them almost daily. Packed full of protein to keep my fuel going. Eggs are great as the feature dish, or as part of something larger. They’re good sweet, salty, savory, and packed full of protein. I love how versatile they are, we have them in omelettes for breakfast, sometimes boiled eggs mixed with rice and incorporate them into desserts (cakes). Eggs can be used for so much. They are a healthy breakfast, lunch or dinner and make great desserts, too. What I love about eggs is that they are fairly inexpensive and so versatile!! I like the convenience and variety of uses. I just love the taste of eggs over easy! I love that eggs have iron in them! I have low iron and love that they are a quick and easy source – not as much as other sources, but I need as much as I can get because I tested really low. We make eggs a few times a week – scrambled and “dipping eggs” are our favourites! I love eggs because they are so easy to cook and are so good for you!. they make a quick nutrition breakfast, lunch or supper! I love eggs because you can use them in so many delicious ways. Eggs are the most versatile food ever! I love that eggs are high in protein, low in calories and very versatile. What I love about eggs is you can have them at every meal.They are so versatile. What I love about eggs is they are healthy to eat, love the taste and they are are very versatile! I love that you can create so many things with eggs! My favorite being Omelettes! I love that eggs hold the dough for baking together so that cake or cookies or muffins hold their shape. I love poached eggs on toast to start my morning. Sometimes soft boiled. Eggs are very healthy when eaten in moderation. They are priced good, and if you keep a dozen hard boiled eggs in the fridge, I can guarantee your friends will be telling you what a great idea while eating them! I love that eggs are so versatile, there are so many ways to cook them. I love the versatility of eggs, you can do soo much with them! I love them baked, poached, fried, scrambled, deviled, you name it, I like it! I love that eggs are tasty, healthy and a good source of protein. Eggs are simply the best food there is! I love that eggs are so healthy and can be used in so many delicious ways! and eat them.They are wonderful in many different recipes! I love eggs because they are such an easy breakfast food! I like that you can boil them up for a quick healthy protein packed snack. Eggs pack a whallop of nutrition, are extremely versatile and budget-friendly, not to mention tasty no matter how they are prepared. I love how versatile eggs are. They are an excellent source of protein, and are so cheap! I love finding new ways to use them. Poached, fried, scrambled, baked heck the more you beat an egg up the better it is, how can you not love eggs? Eggs are great for protein. Eggs are so versatile. Breakfast, lunch or dinner. Eggs are great. I am a PEACH lover … peaches + more peaches = A peachy type of gal! 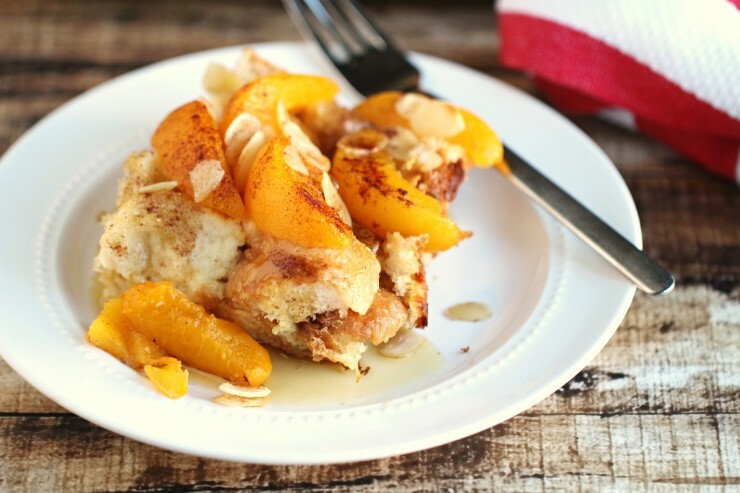 I never knew that peaches and French Toast would go together BUT having said this, I tried it and that gal will never go back to just plain French Toast! Eggs! They wake you up! I love that there is so much variety with eggs! So many different ways to prepare them, and they are so healthy too! Eggs … who does not like eggs !!! What a great prize package !! Good luck all !! When traveling and for when I’m home, I always add eggs to my morning routine. Thanks for the great ideas! Eggs are so versatile, and taste so good. I love eggs because they’re so easy to make and done within a matter of minutes! Cheap and easy for any meal!! I love eggs for breakfast, lunch, or dinner!! Brunch and dessert of course too. i love that you can use them for so many things! Eggs are SO versatile. We serve them up in so many ways and love that they are good for us. I love that eggs are so versatile and can be used simply or added to many types of recipes while still being good for you. I love that they are health AND delicious!! I love the versatility of eggs…I never get tired of all the ways you can eat eggs. Love to cook with eggs because they are easy to use, healthy and delicious. Eggs are good for any meal… scrambled, boiled, in any baked good! They are my favourite and most versatile food of choice! I love that you can add an egg to just about anything – my favourite is a fried egg on top of a root veggie hash. I love that eggs are a great source of protein, they’re versatile can be used as a meal or an ingredient for baking, easy to prepare and are inexpensive. I like that eggs are high in protein and can be used many different ways. Never could have imagined peaches with eggs! I love their flavour and that they are so diverse I can eat them in a myriad of ways!! I love eggs as a breakfast item! I love how inexpensive and versatile and DELICIOUS they are! I’ve been having a couple of eggs over easy for breakfast for a few weeks now and they’re so satisfying! Eggs are good for you and a quick easy meal. I love how versatile eggs are! So many fabulous ways to prepare them. Love how easy and fast you can make them. I love the versatility of eggs! There are so many ways to enjoy them, and they are a vital ingredient in lots of recipes. I love the fact that they are so versatile and that they contain a high amount of protein which is great for a healthy diet. I love that eggs are full of protein…and they are so tasty! I love eggs as they are a great anytime food or snack! I eat egg whites for breakfast, lunch, dinner and snacks. They are east to travel with and high in protein!! I love eggs as they are a great anytime food or snack! I eat egg whites for breakfast, lunch, dinner and snacks. They are east to travel with and high in protein!! I love to support local farmers as fresh eggs are the best!! I love eggs because you can use them in a main meal or a dessert. I love eggs because they are healthy and filling! I love eggs because they are good for you and can be used in so many different ways. Eggs are great! Quick, easy, and packed with protein! I love that eggs can be used in so many different ways – for eating on their own or in various dishes. And more importantly they are good for you! I love how versatile they are. You can create so many dishes with them. I love the creamy taste of the yolks! I love eating eggs any which way! As a frugal frau myself, eggs are by far one of the most affordable proteins available. Love them in the morning, afternoon or as a midnight snack. I love that eggs are so versatile. They can be an ingredient or the main attraction. Like my mom always said if you have eggs and flour you will never starve. I love that if I’m having a frazzled day & have no idea what to make for supper that I can whip up some eggs, bacon, hash browns & toast & my kids think I am Mom of the Year! I love that you can cook eggs so many different ways. What I love about eggs is that there are endless possibilities to the way that you can eat them. My personal favourite is poached though, so yummy! I love that eggs are tasty, high in protein and can be used in so many different ways! I used to have chickens and it was so much fun collecting their eggs. Eggs come in so many different colors, my favourites are blue eggs & chocolate brown eggs! I love how versatile eggs are and how easy they are to prepare. I love how easy eggs are to prepare and how versatile they are for breakfast, lunch or dinner. I love eggs because they are a good source of protein. They make a quick and easy breakfast. We like baking and they make everything light, fluffy and tasty. I love that they are an excellent source of protein that help repair my muscles after an intense workout. I like eggs because they are full of nutrients, tasty and easy to prepare. I love how versatile eggs are and they are a great source of protein! My picky toddler will almost always say “yes” to eggs, making them a favourite for both me and her! I like eggs because when I don’t know what to fix I can always whip up an omelet. Love that Eggs are loaded with protein, lean on the body, and inexpensive. I love gooey egg yolks with salt. Eggs are what make all of my favorite recipes work! They are delicious, and a binding agent! I love how versatile eggs are, they can be used in breakfast, lunch, or dinner. They can be a main dish, side dish, or ingredient. I love that eggs are healthy and tasty! Eggs are full of good protein and are low in calories. They should be considered a super food! Need a snack, eat a hard boiled egg. BAM! Yum I love the taste of eggs and they’re so nutritious ! I love eggs because they are SO versatile! You can make them into anything, scrambled, omelettes, poached, fried. You can put them into so many different dishes like Pad Thai, french toast, desserts. It’s amazing. Eggs are literally AMAZING. there’s so many great ways to cook em! They are easy to cook and difficult to ruin. I like scrambled eggs with tomatoes and green peppers. How yummy this looks! I’m will be trying your recipe this weekend. Eggs are a fast, easy and filling option for breakfast, lunch, dinner or snack! I love eggs because they are so versatile and delicious! I love that eggs are easy to make and full of protein. I love how they make the best sandwiches! quick to eat and plenty of ways to enjoy it too! I love that eggs are the ideal food – they are packed with protein & nutrients and so healthy for you! you can use them for both baking and cooking! Versatility! Fried, flipped, frothed, breakfast, lunch dinner, hot, cold…eggs can do it all! This sounds exquisite! Will definitely give it a try. The thing that I love about eggs is that they are so versatile; you can use them in so many ways to make all your meals and treats taste great! I love the versatility of eggs as well as the taste and, if you have the right neighbors, acquiring them is akin to dropping a couple of coins in a vending machine (or some tasty kitchen scraps in the hen house. (I enjoy bartering something one makes for something one’s neighbor has – win/win for the humans). its a easy and fast meal! I love how versatile eggs are, you can use them in just about any recipe. Eggs are a useful ingredient in many baking dishes. I love that eggs are a great source of protein and that I use them in a variety of different dishes to please my entire family’s tastes. Eggs are cheap and you can create anything with them, use it for breakfast, lunch, dessert, snack! I love eggs because they are so versatile. From a breakfast omelet, to tiramisu for dessert, there are thousands of uses for eggs. I love how versatile eggs are. I love the versatility of eggs, aside from the obvious flavor 😉 I try to make eggs in several different ways, since my little one isn’t a fan, but there’s certain ways that I can even win her over with some eggs lol. Egg clouds for instance are a huge winner with her! I really like this recipe for Peach French Toast. I make French Toast on occasion but I have never used peaches. I know the peaches will add a lot of flavor. Thank you so much for this recipe. I intend to make it with whole milk as I have to be careful of our diets. I know it will taste delicious. I like to read the comments when I make a new recipe. Did anyone actually read all these comments? Majority of them are about how wonderful eggs are – not about the recipe! Sorry to sound negative… but I’m disappointed in all these fake comments – giving you the impression that many people have written a rave review about this recipe!